As you consider a community solar garden offer, it’s important to understand how it will deliver value to you. This article breaks down the two main types of pricing models – ownership and subscription - in order to help you more accurately identify an offer’s value and choose wisely. It is common (and even required in some states) for community solar gardens to be jointly owned by participants. If you own a share in a solar garden, you will pay a set price for it – which you can either pay for up-front with cash or finance with a solar loan. Once you recoup your initial investment through these savings, you will continue to receive free electricity in the form of solar credits until you sell your share or the project is decommissioned – which can be 25 or more years. Based on our analysis to date, installing solar panels at your property will allow you to save significantly more money than a community solar garden. Community solar is best suited for consumers who cannot install solar on their roof and are primarily interested in the environmental benefits of going solar. Even if you have signed your name on the back of your solar panels in the solar garden, remember that this is mostly symbolic. As the owner of a share in such a project, the important thing that you ‘own’ is the rights to the electricity that your share (percentage) of the solar garden produces. In fact, contracts place restrictions on what you may physically do with ‘your’ solar panels. For example, you may not take them home until the project is decommissioned. This is a good thing in many ways: Once you’ve bought your share, your panels are worth much more in the solar garden than at home on your roof. In addition to the panels, a solar garden is comprised of many commonly shared, non-divisible components (such as inverters) that allow the panels to efficiently produce usable electricity for all owners. Remember that ‘your’ individual panels are not directly linked to your power bill. Instead, overall monthly solar garden output is always divided between all owners according to each one’s share of ownership. So it’s in your interest – and everyone else’s – for your panels to stay put. Shares of a community solar garden are variously marketed in terms of the number of ‘panels’, ‘kilowatts’ or ‘watts’ (1kiloWatt =1000 watts) or (sometimes) ‘leaves’. It’s important to pay attention to the total Size or wattage (W or kW) of the share that you are signing up for. How much will you pay per watt? Wattage is the measure that is indicative power output. Knowing the $/watt price will enable you to compare offers apples-to-apples. How much electricity will your share produce? If you are comparing different offers, you may find that one promises more solar power per watt than another—either because it uses solar tracking equipment, or because it is otherwise more optimally designed. How much value will this add? What is the estimated payback period for your share? How much you will save each year? The cost of a share includes not just panels, but also all the other equipment that makes up the solar garden, plus monitoring software (if offered), project administration and ongoing operations & maintenance costs. Does the offer take all of these into account? Although you may be eligible for some state-based tax incentives, federal tax credits will generally go to the company that develops the project. In states where they are offered, you may also be able to receive SREC payments. Check the contract for details. If you move within the same utility area, you can usually continue to receive the solar net metering credits associated with your share. Exit from the program will involve either selling your share or gifting it to someone else. The second option for joining a community solar garden is a subscription. If you subscribe to a program, you will either pay for your solar electricity on a monthly basis through a type of Power Purchase Agreement (PPA), or in a one-time up-front payment. 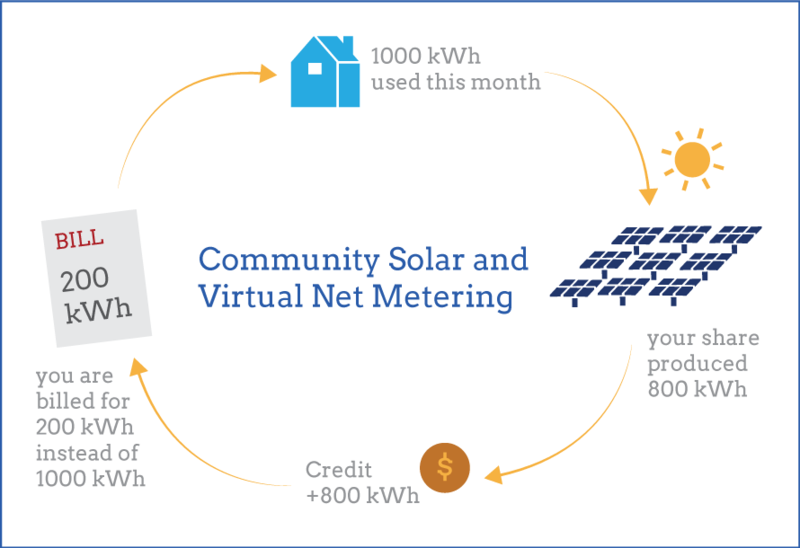 Most subscription-based community solar programs promise either immediate or eventual savings on your electricity bill, while some others may sell a subscription as a way to support clean electricity and not necessarily as a money-saver. Will the program now or eventually save you money? Some programs focus on the environmental benefits of going solar, while others emphasize savings. The environmental benefits are the same whether you save or not, so you should try to save as much as possible if you have the choice. Early termination fees: Most programs are likely to charge fees if you exit before the term is up. If you have to move before the contract term is finished, are you likely to have saved money? What is the point at which the savings you’ve earned will be greater than the total you will have spent, including exit fees? These considerations are particularly important if you think you may end up moving out of state before the term is up (termination fees generally do not apply if you move within the same utility area). The program administrator may allow you to avoid termination fees by transferring your subscription to someone else who wishes to subscribe and who meets the program requirements (credit score, etc). What subscription-based pricing model are you working with? The table below provides an overview of the various subscription-based pricing models that you may encounter as you consider getting involved in a community solar garden. You will lock in a set discount over your utility electricity tariff rate: for example 5% or $0.01. The actual rate you pay for solar will therefore fluctuate with utility rate. Immediately, unless they charge a membership/signup fee. In the first year you agree to pay a set rate for solar power. In all subsequent years your solar rates will gradually increase by a set percentage (e.g. 2.5%). It is reasonably assumed that your utility rates will escalate more quickly (e.g. 4.5%). Immediately or in a few years - depending on the price of solar electricity under the program. Rate paid for solar electricity never increases over duration of contract. Initial rate may be higher or lower than current utility rate. Immediately or in a few years - depending on the price of solar electricity under the program. Solar energy production is chunked into 'blocks', for which subscribers pay a flat monthly fee while receiving a set number of solar credits on their bill. Savings are delivered as utility rates rise while solar payments remain fixed Immediately or in a few years - depending on the price of solar electricity under the program. Regular, flat monthly payments for solar which cease after a set number of years, after which point solar credits are 'free'. (Project share may not technically be owned by subscriber). Immediately or in a few years - depending on the price of solar electricity under the program. You prepay a one-time flat fee to lock in a deeper discount on ongoing solar rates (as compared to utility rates). In a few years - once upfront payment is recouped through monthly savings. You will pay for all projected solar electricity generation over a set duration (e.g. 20 years), locked in at a set rate per kWh. Some companies offer a discount for up-front payment (vs ongoing payments). Solar credits are applied to customer's bill over the duration of the contract. In a few years - this arrangement is akin to purchasing a system, in that savings are deferred until the initial investment is recouped.